The idea of making your first investment can seem daunting however it doesn’t have to be with the right guides. 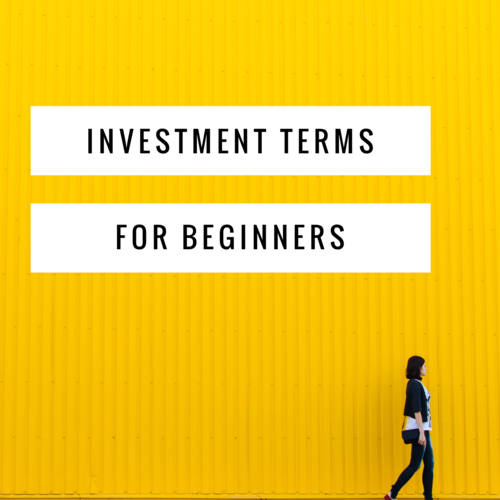 You’re never too young to invest and you’re never too young to understand investment terms. Although there is a lot of investment jargon, here are some investment tips to know to get you started. While there is some interest on your savings, the return you earn is very little in comparison to other investments. In other words, savings really aren’t making your money go as far as it could. Investing can make you a lot of money but it can also make you lose money. One investment doesn’t necessarily determine the outcome of the next investment. Ensure that you are comfortable with the amount of risk going to each investment. A security is a financial instrument. It represents ownership of debt securities, equity securities and derivatives. An example of a debt security is a bond. An example of an equity security is a stock and an example of a derivative is an option. More on bonds, stocks and options below. A bond is when you loan some money to an establishment (government or banks) and they use the money to finance other projects. You are paid interest on the bond and you receive your money back at the maturity date. Stocks, meet equity. Equity, meet stocks. Equity and stocks are the same things. Once you buy stocks into a company it means you own a part of the company. How much you own is up to you and your pockets. Stocks have a lot more unpredictability than bonds and is dependent on a variety of factors. The stock market is where stocks and bonds are traded (bought and sold). The main stock exchange for the UK is the LSE (London Stock Exchange). This is where financial instruments are sold from day-to-day. The Financial Time Stock Exchange (FTSE) 100 is the most dominant index on the LSE. FTSE 100 lists LSE’s largest companies as is usually referred to as “blue chip” companies. Diversification mean having a variety of investments. This is usually done to reduce the risk in your investments. Regardless of the reason behind diversifying your investments, never put all your investments into one pot. Copying everything Warren Buffet does will not lead you to early retirement. Always do some of your own research and make up your own conclusion without being heavily influenced by unreliable external factors. In our youth, we are constantly reminded of how much time we have. Realising that time is one of the best assets you have is what can potentially set you up for the future. Remember that most investments require you to part with your money for a certain period of time. There is no point investing money in something when you know you will need the money back within 6 months of investing it. When it comes to investing, think long term plans instead of short ones. There are professionals out there that will help you invest your money correctly. They are usually called Independent Financial Advisors (IFA) or financial planners and wealth advisors. The first consultation should be free and from there you can gain some information about what services they can provide you with. Irrespective of who you choose, ensure that you are confident in your decisions and investments.